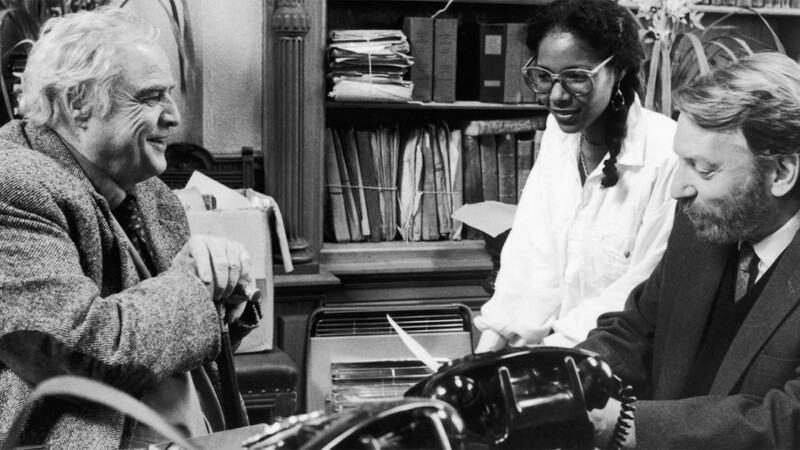 In 1989, Euzhan Palcy became the first black woman to direct a major studio movie when she helmed A Dry White Season for MGM. A brutal yet inspiring anti-apartheid drama, A Dry White Season remains a model of political filmmaking, as Palcy (adapting Andre Brink’s novel with co-screenwriter Colin Welland) boldly and forcefully indicts the South African government of the period with clarity, complexity and passion. Donald Sutherland plays Ben Du Toit, a schoolteacher (a surrogate for both Brink and the movie’s white audience members) who keeps his head buried in the sand when it comes to the injustices around him until he can no longer ignore the violence or deny his own complicity in the system. Sutherland is surrounded by a gifted ensemble of South African actors, and Palcy scored a major coup in one of the supporting roles by convincing Marlon Brando to come out of retirement. Her film, which was brave and shattering on its initial release, has only improved with age, and Criterion’s new special edition on Blu-ray and DVD is essential viewing not only for the superb transfer but for a collection of enlightening supplements. It’s such an uncompromising movie that upon revisiting it I was amazed all over again by Palcy’s achievement; I wanted to know how she got this made as an American studio film in the conservative Hollywood of 30 years ago. We spoke by phone on the occasion of the Criterion release, and I began our conversation by asking Palcy how she discovered the book and began the process of securing the rights. Euzhan Palcy: After Sugar Cane Alley, I knew that I wanted to make a movie about the situation in South Africa, something that people could easily understand. At the same time, I knew that it would be impossible to get the money to make such a movie. A friend of mine who was a journalist in Martinique gave me the book; he said, “Okay, I have a gift for you. You should read this book because you want to do something about South Africa.” That’s how I discovered the novel, and I immediately saw what I could do with that book. But I didn’t know Andre Brink, I had no contact information for him, nothing. I didn’t know how to get in touch with him. Eventually, in Paris, I came across somebody who had been in touch with him, and he was a producer—an architect, actually. We were talking about my project and he told me that he knew the book, and he knew how to get in touch with the author. So, I told him that I would like to talk to Brink and sit down with him, and later on when he was traveling in the south of France I managed to get an appointment with him. He came to Paris, and I told him that I would like to make a movie based on that book. The whole time I was thinking, “Okay, what can I tell him to make him say yes?” Because he was a bestselling author and I was just this young filmmaker—what gave me the right to even approach him? But then I said to myself, “You know what? To hell with that. I’m going to be myself. I’m going talk with my heart, like I always do, and just see what happens.” Funny enough, when I got to the meeting he said to me, “Oh, I’m so happy to meet you. I have been showing your movie secretly to my students in South Africa.” He was talking about Sugar Cane Alley! Because Brink was a history teacher, like the character of Ben Du Toit in A Dry White Season. When he said that to me, I said, “Wow, that’s fantastic,” and the door was opened. So I told him, “When I read the book I knew that I had to make a movie based on your book, and you wrote that for me. This is for me. You did it for me. So nobody else can do it. I have to do it.” He was laughing, and he said to me, “I would be so honored.” And he told me that he had turned down at least seven to ten offers from the States, from people from the studios who wanted to get the rights to make the movie. He was very scared to give the rights to the studios, because he didn’t want anybody to betray his story. He said, “Well, I know that the woman who did Sugar Cane Alley cannot betray my work. Let’s talk more about it and then do whatever is necessary for you to do the movie.” That’s how the whole process started. Filmmaker: Didn’t you take the movie to the Sundance Lab at some point fairly early on? She asked me, “Do you know David Puttnam?” He was a star producer. She said, “Well, he’s European, like you, and he’s a great producer. He’s never worked with a woman director, but let me ask David if he would consider producing your movie.” Puttnam said he loved Sugar Cane Alley, but he wanted to sit down with me and see how he felt about me. He came to Paris and we had breakfast, and he asked me to tell him about the story and what I wanted to do with it. I did, and he said to me, “I love it. I love it.” So Warner Brothers bought the rights to the book, developed the story with Puttnam, then Puttnam became the head of Columbia Pictures. I stayed at Warner Brothers and Lucy said, “Okay, so now I want you to choose your producer. Pick the one that you feel comfortable with. I want you to make a good movie and to be happy.” I never expected this from a studio. I met Paula Weinstein, and I knew immediately that she was the person. So we developed the project and we did all these things and, unfortunately for me, Attenborough’s Cry Freedom came along. The head of Warner Brothers said, “Two movies about South Africa and apartheid, no, we don’t need that. There is already a Richard Attenborough movie, so that’s it. No more.” I said, “Hey, guys. I brought my story to you. I came with the book and I did all these things. And you are locking my project in a drawer. And that’s it? This is my life.” But they wouldn’t make it and they wouldn’t let it go. Luckily, Paula and I had friends, people like Jane Fonda and David Puttnam and others who called the head of the studio and said, “This is her project. Please, let it go.” They put so much pressure on the studio that one day they said, “Okay. We are giving you a week to come up with a check.” If I could pay them back for what they spent on the screenplay and development I could have the movie back. I don’t think they believed there was any way somebody was going to write a check like that for a movie about South Africa, but Paula had a very nice relationship with Alan Ladd Jr. at MGM, who asked me to pitch the story. I told him the story, and he said, “Well, if Warner Brothers is willing to let it go, I’m in. I want to do it.” Paula and I were dancing. And then we started the whole process of casting and making the movie. Filmmaker: For the black characters you were intent on using South African actors, as opposed to African-American actors, right? Was there any resistance to that idea? Filmmaker: How did you wind up with Donald Sutherland? I’ve heard that Paul Newman actively campaigned for the part, and he was a bigger star at the time. I’d suspect he would have been far more desirable for the studio. Filmmaker: It sounds like you had a kind of dream situation with Ladd and MGM. Palcy: I felt very comfortable with them. Everything that Lucy Fisher wanted for me at Warner Brothers, MGM gave to me. I was at home there, and I made the movie I wanted to make. They gave me what I asked for to make the film. Thank God Robert Redford put me on the plane and sent me over there to Hollywood, because maybe I would never have made the movie otherwise. But you know, it was a one-time thing. I thought that the door was open, and that black filmmakers would have a chance and that I myself would have a lot of chances to make the movies that I wanted to make. But they only wanted me to make their movies; they weren’t interested in the stories I wanted to tell about black characters, because they said they didn’t know how to market them. It was hell, really, for me. I was so desperate, and so insulted, at the same time. I couldn’t understand why being black, or being yellow, or whatever color, meant you had no right to be on screen. Even if it’s a great story or it’s universal, nobody will go see it? I couldn’t accept that. And people were getting mad at me, my agents at William Morris and people like that, because they couldn’t understand why I wouldn’t just compromise—why I wouldn’t change a story about a black woman to give it a white lead. Eventually I made a three-part documentary film about a very famous poet and playwright, Aime Cesaire. He’s one of the fathers of the negritude movement, and he was from Martinique, my country. When they saw that, they understood who I really was, what kind of filmmaker I was. And they said, “Okay, we understand now. You know where you came from. You want to give back. Okay, fine.” And they left me alone. They weren’t upset at me anymore. And then, when Disney television called me to do Ruby Bridges, and after that Paramount called me to do The Killing Yard, about Attica, I did them. I said, “These are not my stories, the ones that I have in my luggage, but they’re part of the same world.” I filmed them because it’s very important for the world to know the story of Ruby Bridges and to know the story of these Attica guys. I did them with my heart, and in the back of my mind I knew that things would change. Don’t ask me how, but I knew it. I knew things would change and I had to hold on to things and to keep writing. I worked in Europe on other stuff, and I trained young filmmakers in Africa and in Paris and in South Africa. I didn’t waste my time. And I won’t stop, I have more stories. And today, look what is happening. Look what is happening on television. My dream came true when I saw, for example, the show that Shonda Rhimes did, How to Get Away With Murder. I said, “Oh my God.” All the stuff that she did, I fought for it for years. Pushing for black actors to tell black stories, and she did it. I mean, she completes my dream. All the reasons why I fought and I was resilient, there it is. She did it. So, I’m very happy because I paved the way.